Beautiful! The crystals are real glass, not plastic and the purple is a deep purple and makes my she cave feel like a castle. Wish I had room for two. The Rococo collection starts with the classic look of a hurricane lamp, then dresses it up with flamboyantly draped strands of octagon, diamond, and pendeloque royal-cut crystals. The frame itself is a work of beauty, consisting of ornately etched crystals balls and vases, capped by a scalloped glass dome and vase, all in a wide array of colors. Petite in size yet grand in appearance, Rococo hanging pendants are perfect for a spot of elegance in smaller areas. Available in Black Finish or Purple Finish. 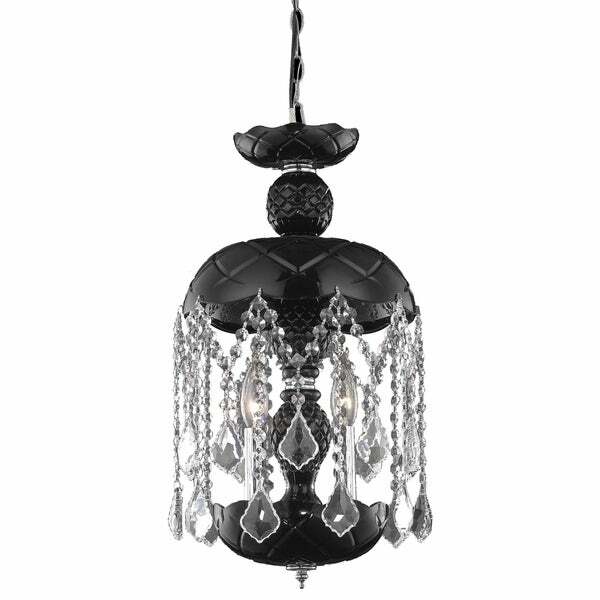 This Rococo Collection 3-Light Pendant with Royal Cut Crystals had a diameter of 11 inches and a height of 20.5 inches. Dimensions 11.0 In. X 20.5 In.